RockUnitedReviews: DANGER ZONE: "Line Of Fire"
DANGER ZONE: "Line Of Fire"
Apparently, this is the one we’ve all been waiting for. Seriously! 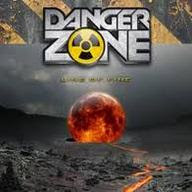 Recorded back in 1989, Danger Zone’s second album was hotly anticipated (it sez here…) but never released due to the usual record company/money ins and outs. As they’re an Italian band, it seems right that the new, hardworking label Avenue Of Allies should be the ones to dig it up, polish it a bit and finally allow it to see the light of day. News that the band are back together and recording a follow up will no doubt please those who helped this one gain ‘underground cult status’, but if I’m honest I haven’t a bloody clue who they are. It’s immediately apparent why there was a bit of a fuss about “Line Of Fire”, as Roberto Priori’s introductory widdle gives way to some awesomely wimpy keyboard and guitar riffage with both feet firmly planted in the Eighties. Vocalist Glacomo Gigantelli has a good, throaty voice with some impressive pitch to it, and the whole thing is incredibly hard to dislike if you like your rock music wimpy and retro. The songs are all good, and there’s even a very good cover of “Children Of The Revolution” that doesn’t make you want to cringe. Ballad “Walk Away” goes a bit too far to the wet side to be of much use, although “That’s Why I Fell In Love With You” is much better. They rock it up a bit on the speedier “The Hunger”, but even then it’s pure AOR rather than heavy rock. I have a feeling that if I had owned this on record twenty years ago it would be one of those albums I would love to have on CD, so there must be people who saw the band live back then who are salivating at the prospect of finally hearing these tracks recorded. This is a very strong late 80s slice of AOR, full of catchy tunes and good musicianship, and I hope that the new material is as good, because Danger Zone deserve a second shot at the AOR title. WANTED: "Too Hot To Handle"
ONE GLIMPSE AWAY: "1991 EP"
TWISTED SISTER: "You Can't Stop Rock 'N Roll"
MISS BEHAVIOUR: "Last Woman Standing"
TNT: "A Farewell To Arms"
HELL IN THE CLUB: "Let The Games Begin"
JOHN WAITE: "Rough & Tumble"